21 TARAS EMPOWERMENTS were completed successfully! the venerable Lama Kunga Rinpoche completed his week-long transmission of the rare Surya Gupta tradition of the 21 Taras. A steadfast group attended all empowerments, while some others received the first and last ones. 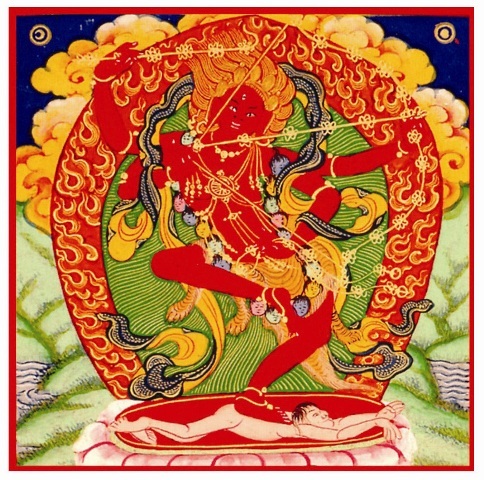 After the completion by Lama Kunga Rinpoche, there was a unique musical presentation created by Anahata Iradah of Rinpoche’s recitation of the 22 Tara mantras (recorded in Hawaii) counterpointed by her own melodious voice singing them to instrumental music. Participants then enjoyed a tsok feast together. Break for lunch at EC for an hour. Bring lunch. Description: There will be a one-hour break for lunch at EC. Please bring your lunch. Lama Kunga Rinpoche kindly bestowed the empowerment of Kurukulle. It was very successful, and almost forty people attended. On Sunday, Nov 22, at 1pm, Lama Kunga Rinpoche is offering a Blue-Jacketed Vajrapani Empowerment . 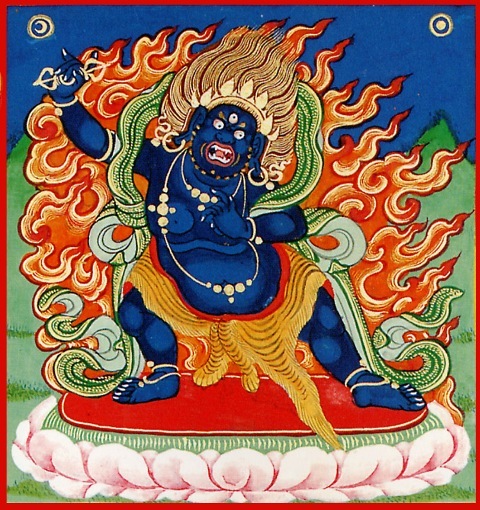 Vajrapani (Tibetan: chag na dor je. 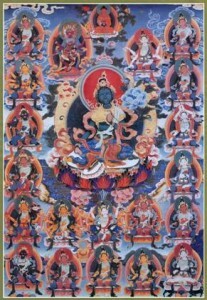 English: the Vajra Holder) is the wrathful yidam, representing the power of all Buddhas. The Blue-jacketed Vajrapani is an uncommon practice in the Sakya tradition said to reverse negative forces and/or obstacles that are beyond the control of the practitioner, like bad spells, curses, ill wishes, etc. This practice also helps to stop naga diseases, like infectious blood diseases. We ask that you arrive by 12:30 to complete registration. We request $30 donation and traditional offering to the lama (dana) is separate. Simhamukha Empowerment on October 25th. Description: Lama Kunga Rinpoche will kindly bestow the empowerment of Simhamukha (Senge Drongma), the Lion-Faced Dakini.